We loved Naim’s original Mu-so when it was introduced, offering form, function and Naim build quality in a do-it-all enclosure. It was reasonably priced for the level of performance offered, but because of the fairly large size, couldn’t fit everywhere. 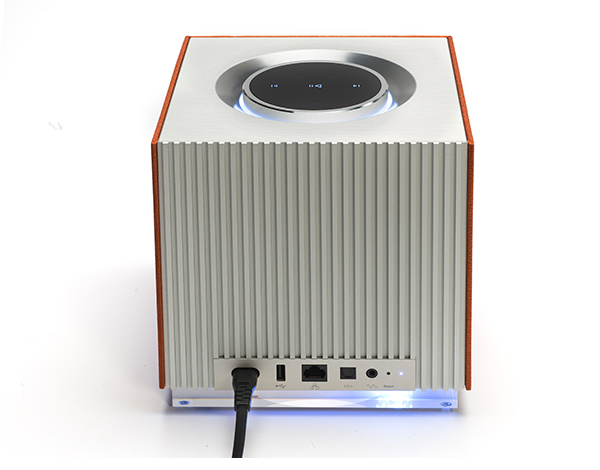 Somehow, Naim’s clever staff of engineers have managed to squeeze nearly all of the performance of the big Mu-so into the diminutive 8-inch (8.3 x 8.3 x 8.6 inches to be exact) cube. They’ve also squeezed the price down to $995 – impressive. Before listening could begin in earnest, the photos needed to be taken and during this time the argument ensued as to where the ultimate resting place of the Qb would be. It only took a few minutes of initial listening to decide this would be a keeper, so on one level, this review is stilted a bit towards that of a giddy fan. Cool as the original Mu-so is, we couldn’t find a place for it at chez Dorgay. So back to our friends in Salisbury it went. But this little cube is too cute to ignore – and it packs a wallop. When was the last time you had a major experience just turning a component on? You might think I’m crazy, but I highly suggest turning on your Qb in the dark the first time you power it up. 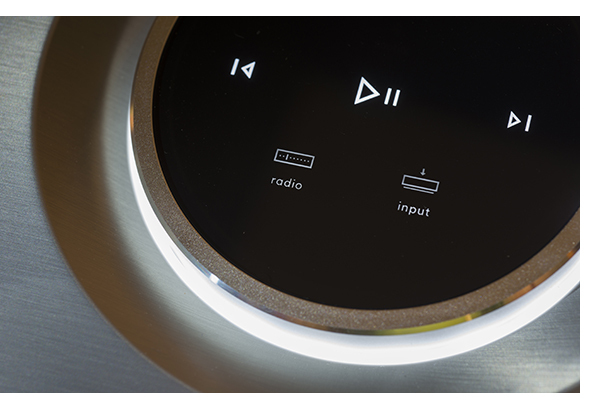 Naim’s app makes it easy to control from your smart phone, but you’ll want to give that big, weighted volume control a spin. You’ll want to get up, walk across the room and interact with the Qb, it’s that cool. Peel off the gorgeous, sculpted, three-panel grille (available in black, red, blue and the awesome orange you see here) and you see serious hardware inside and out. The front panel features a pair of soft dome tweeters and a pair of midrange drivers, both angled to achieve maximum stereo separation – each driven by its own 50-watt amplifier. The front-firing bass driver is given both a 100-watt amplifier and a pair of passive radiators on the side panels – that’s 300 watts total. This is where the low frequency grunt comes from. 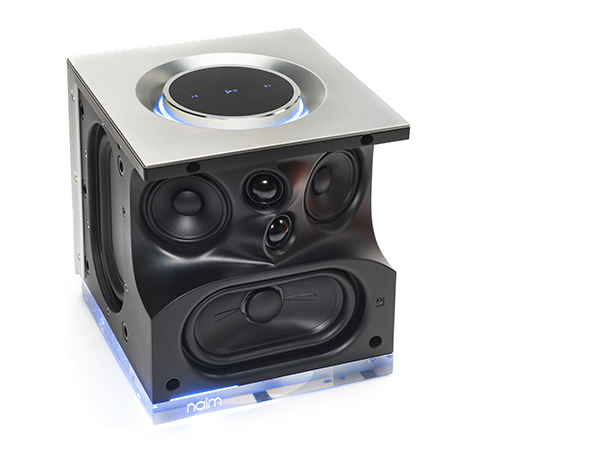 The hardware is precisely screwed down to the aluminum frame with the same level of quality found in Naim’s flagship components. The 32-bit DSP engine lurking inside is derived from what the company has learned supplying Bentley with their sound system, again underlining the quality that oozes from the tiny cube. All of this makes for great nerd fodder, which you won’t care about the minute you play some music on the damn thing. And it won’t take you long. Earlier Naim server products took a while to wade through the setup procedure, but the Mu-so is quick and easy. Download the app for whatever smart device you own and a quick menu walks you through things. With the iPhone, once you enter the color of the blinking indicator and your network password, it’s rocking. The only setting you need to pay attention to carefully is the EQ setting – close to wall or out in room. Get this wrong and your Qb will either sound thin or boomy. Should your overenthusiasm get the best of you, and it sounds naff, go back and double-check your work. Bluetooth is equally easy to pair; you’re about 30 seconds away from using that mode to connect. The Qb offers crazy connectivity. WiFi, Bluetooth/aptX, TIDAL, and Spotify Connect are just the beginning. A standard Ethernet port is also provided, and if you have a large collection of music on a NAS drive (especially if some of it is in high resolution), it’s a good idea to cable the Qb to your network, as it does offer 24bit/192kHz capabilities. If all that wireless connectivity weren’t enough, an 1/8” analog jack is right there, begging for you to plug a turntable in. I dare you. Unable to resist the challenge, we spun some LPs via the new Rega Planar 3 we just reviewed, coupled via the Lehmann Black Cube and a WireWorld interconnect. 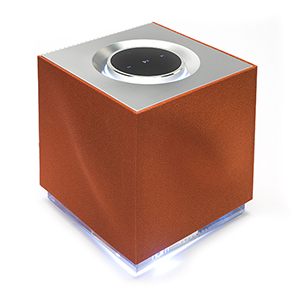 Granted, adding a turntable and a phonostage to the mix goes somewhat against the grain of the compact vibe the Qb presents, but if this is your main music system, it works brilliantly. I can’t imagine someone who is space challenged coming up with a better choice than this to take advantage of their vinyl collection and their favorite digital tracks. Placed beneath a flat screen TV, it also makes for way better sound than those dreadful standard issue TV speakers too, making a Qb even easier to justify. Dialing up Lindsey Stirling’s latest, Brave Enough, and turning the Qb up to 11 rattles my bathroom walls. Yeah, that’s where it ended up so you-know-who could jam out during her morning ritual. But turnabout is fair play and just as that certain someone thought they were in for a peaceful morning bath, taking over the TIDAL app and swapping the current musical program for the alarm clocks in Dark Side of the Moon proved interesting to say the least. Should you purchase a Qb and wish to keep shenanigans to a minimum, log in with your own TIDAL account. While the Qb nearly blew the windows out of our bathroom, it proves equally capable in a larger room. Sitting on top of a five-figure pile of mega gear, between the Sopra no.1 speakers that make up The Audiophile Apartment’s reference system, the Qb throws a huge soundstage in all directions. Jean-Michel Jarre’s Equinoxe fills the room with all the trippiness you expect from this disc. The extra LF power and definition gives it the extra oomph to make it feel like you are listening to a much bigger system. Regardless of program material and volume level, this tiny cube floored everyone who visited. It was beyond amusing to have the Qb sitting on top of my DAC and have a guest say, “what’s that little orange box for?” only to answer “that’s what you’re listening to.” Keep in mind the Bose Wave Radio II has an MSRP of $100 more than the Naim Mu-so Qb, and it’s all plastic. It’s heresy to think that you might buy the former. If you have, unfriend me on Facebook right now, I don’t want to know you anymore. With high-end audio being so daunting to so many, I can’t think of a better way to buy a great music system than the Naim Mu-so Qb. The price is right, the performance is off-the-chart good and you can connect it to just about anything. Best of all, you can move it around the house or office as you need it. Should you be part of the audiophile world and need a second system, or if you are a current Naim owner wondering if the Qb passes muster, the answer is “without question.” Best of all, it will sync up with your existing Naim Net system if you have one, so you can hear music everywhere in perfect sync. Compact audio is enjoying some major success these days, with incredible offerings from a number of manufacturers, but the Naim Mu-so Qb is something special. Should you wander to your Naim dealer for a demo, I hope you enjoy this one as much as I do.